The first thing you'll notice after updating to v2 of Motion Stills is a new look to the main controls. The mode icons hovering in the viewport are gone, replaced with text labels in the lower bar. When you wanted to begin recording some activity in the old version, you'd simply tap on the active mode button to get started, but the new version provides a visually intuitive button in the center to play the same role. The camera switcher has also been moved to the bottom-right corner. If you're paying attention, you'll also see a new label, but we'll get to that in the next section. 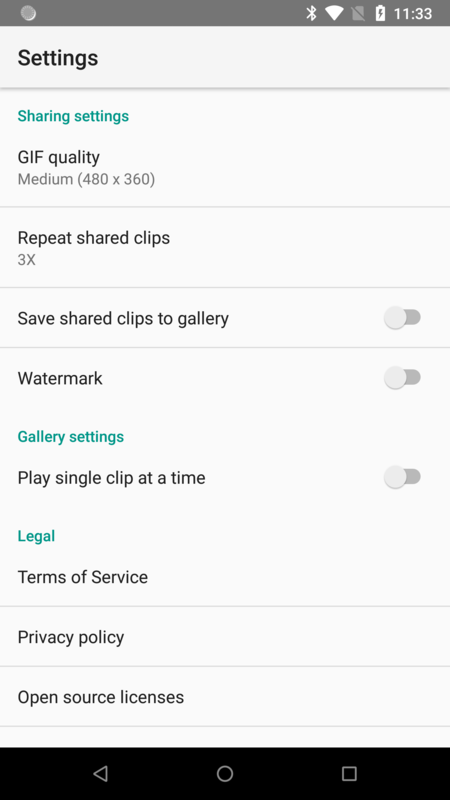 In the old version, your photo gallery took the place of that big white bar below the mode selectors. You could tap on it or drag it up to begin browsing your work. Since the latest update has moved basically everything into that same location, there is now just a tiny thumbnail off to the left that shows what your last picture looked like. Naturally, tapping the thumbnail will open that gallery. 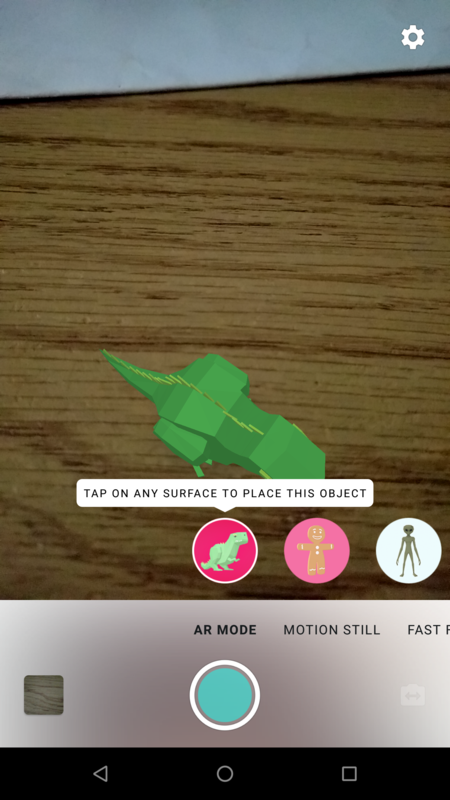 AR stickers may not be all that useful, but they are pretty fun and great to show off to friends that aren't in the loop yet. Google has been slowly injecting them into a few of its camera-oriented apps ever since they were unveiled at last year's I/O. 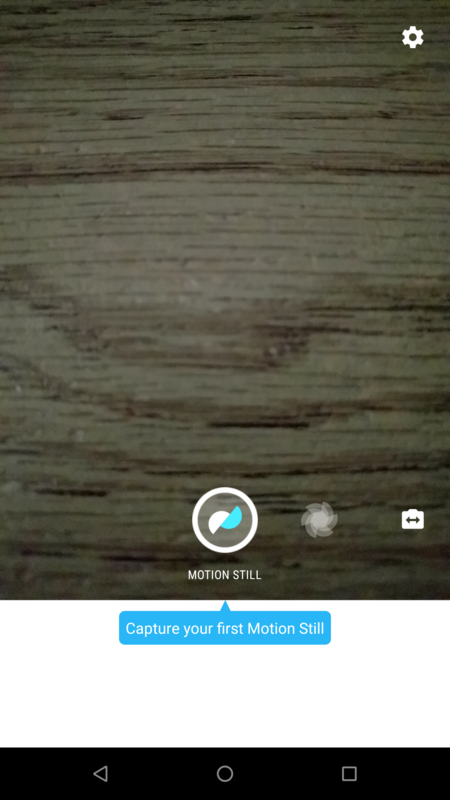 Motion Stills is the latest to get the special treatment. After switching to AR Mode, a T-Rex is automatically selected and placed in view. 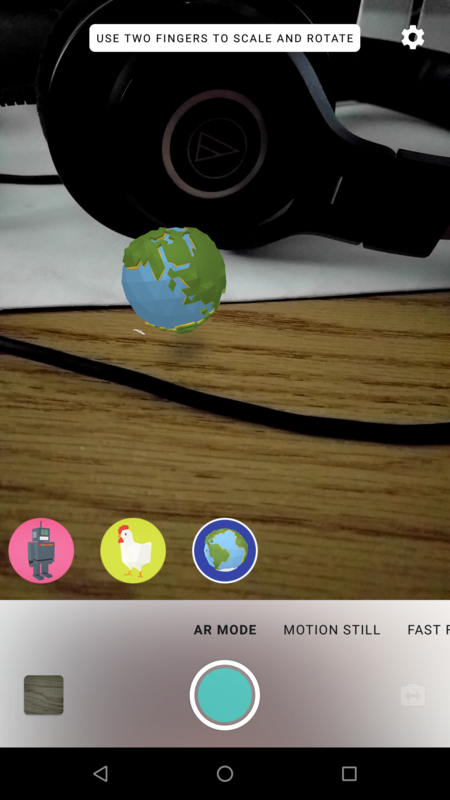 You can slide the selector to change the sticker, and tap anywhere on the viewfinder to pick a location to place the object. 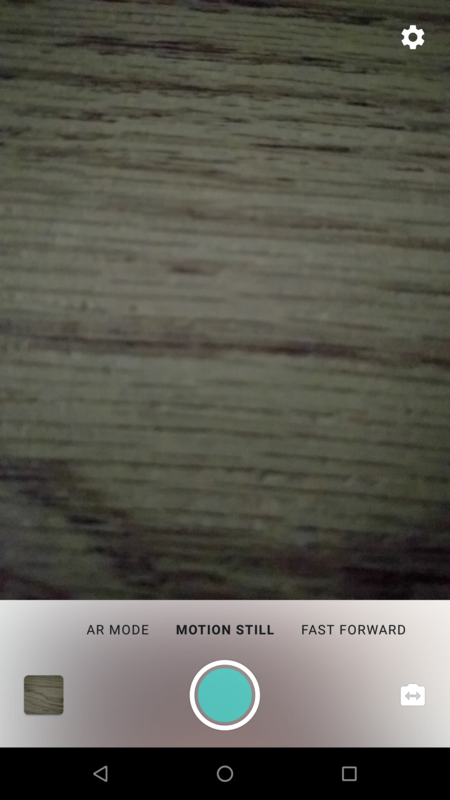 Use two fingers to rotate the object and resize it. 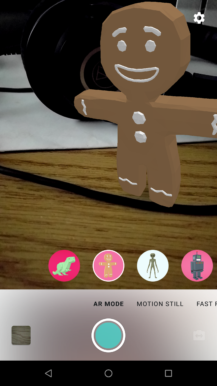 There are currently just six AR stickers to choose from: Dinosaur, gingerbread man, alien, robot, chicken, and planet. However, there are icons for a few additional stickers, but they're not live yet. These will be: Basketball, bat, parrot, and UFO. Update: In a minor update, the additional icons were removed. Perhaps they won't be added to the app after all. Above: Current AR models. Below: Not yet available models. Strangely, you can only place a single AR sticker. Picking a different model will replace whichever one was already in the scene. There are no buttons to add additional models. 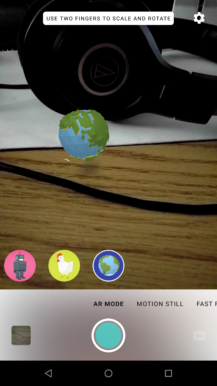 Oh, and just to be clear, the AR mode doesn't require the just-activated Pixel Visual Core. I've tried it on a Nexus 6P and it ran without a problem. If you're interested in a few more details about how the AR models are positioned and tracked, check out this post on the Google Research Blog explaining some of the process. The Settings screen got a little attention, as well. Configurations that have multiple options – basically just GIF quality and repeat shared clips – will now show the current setting below the title so you don't have to tap on the line to see what is selected. 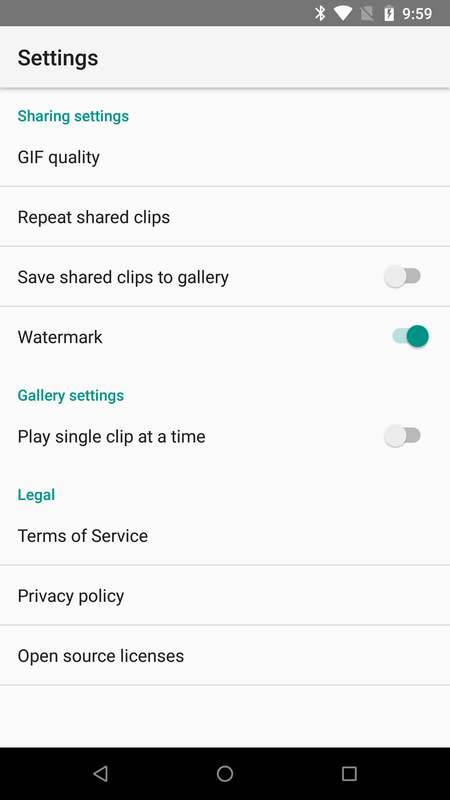 Also, the Watermark option is technically disabled by default now, but if you already had Motion Still installed and left Watermark enabled, it will retain that setting after the update. The final note for this update is that it includes an SDK from Facebook. Nothing in particular is spelled out, but it looks like this will enable Motion Stills to be used with the Facebook Messenger "Platform" – basically, it'll probably be a plugin that makes it slightly more convenient to launch and use Motion Stills from Facebook Messenger. I've already tried a few things in both apps, but it doesn't look like this is live yet. There is text taken from the teardown, but it's all basically the generic stuff included with the SDK.